Realizing 11X growth in monthly web lead flow. The Indy Chamber team is known for uniting business and community in the nine-county Indianapolis region. But by the end of 2017, the organization’s digital presence wasn’t matching up with its impact in the field. With an average of four online leads coming in per month, the potential to better engage more people was great. To tackle the challenge, the Indy Chamber turned to Design On Tap. 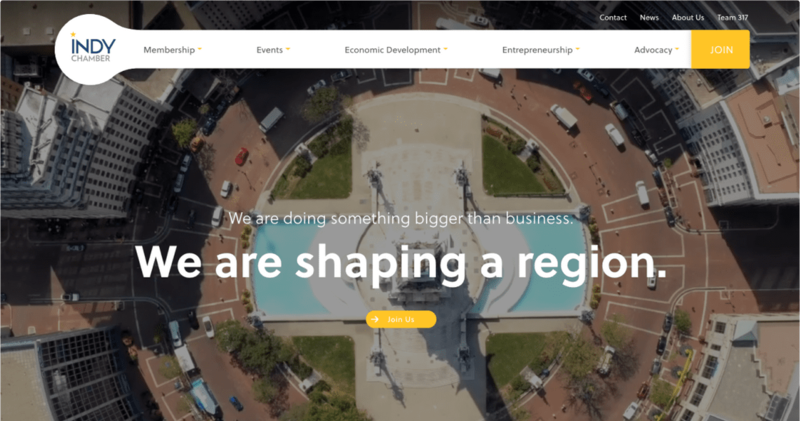 Just seven months after Design On Tap took the new IndyChamber.com live in January 2018, Joe Pellman, Indy Chamber’s Director of Marketing and Communications, reports (dare we say) shocking results. In 2017, Pellman knew the old website wasn’t doing the Indy Chamber any favors. In fact, it was likely hindering his team’s ability to be successful. “One of biggest things we do is provide opportunities to engage our membership, but if we can’t quantify that, it’s difficult to determine if we’re being effective,” Pellman says. Before working with Design On Tap, the Indy Chamber tried things to make progress on their journey to measure membership engagement. They put digital database systems in place, but the programs couldn’t talk to one another. Website edits meant to gather useful data never seemed to work as expected, and the user-friendliness factor was nil. Pellman says the site felt like it was doing its 2,000+ members a disservice by not holding up the Indy Chamber’s end of the bargain — ouch. It was time for real change, and an RFP. Pellman first met the Design On Tap team as they were coming on as a new member. He had heard about their technical capabilities from a peer, but that isn’t what tipped the scales in the vendor selection process. For the kick-off, Design On Tap met the Indy Chamber folks in their 19th floor headquarters overlooking Monument Circle. Together, they set measurable goals and benchmarks for the entire project and started down the journey of understanding their target audience from a timeline and progress perspective. Having a third party ask the tough questions allowed interviewees to more honest and gave Pellman’s team incredible insight into the digital experience that would become the new indychamber.com. 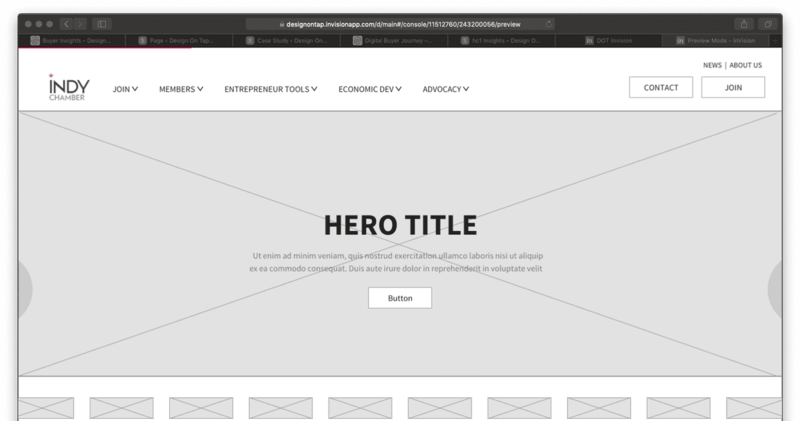 “Everything gleaned from the research phase informed the navigation and user experience and sitemap. That was an aha moment for me,” he says. The new site is organized so members can find what they need more seamlessly, while prospects are encouraged to find and move through an intentional join journey. Before, the Indy Chamber team thought about their members in three very defined buckets, but those segments didn’t prove as useful as expected and, therefore, didn’t drive site content. Only about a third of the previous site’s pages were retained for the new one. “One of the great things about the DOT team is that they allow us to throw new ideas on the board every week. We are able to either pursue those things in the short term or pivot when we need to,” he says. While most other vendors prescribe a strict timeline and deliverables, DOT’s agile approach proved valuable, and created a space for Pellman and his team to let their nerd flag fly. Talks around professional wrestling and Broadway shows were not off limits. “We’ve created this cool bond with Design On Tap that is a bit unique for the kinds of vendor relationship that we might have. “Our work with DOT has been successful because of the relationships we have been able to build with their team. They are very creative and collaborative, and each person brings something new to the table,” he says. 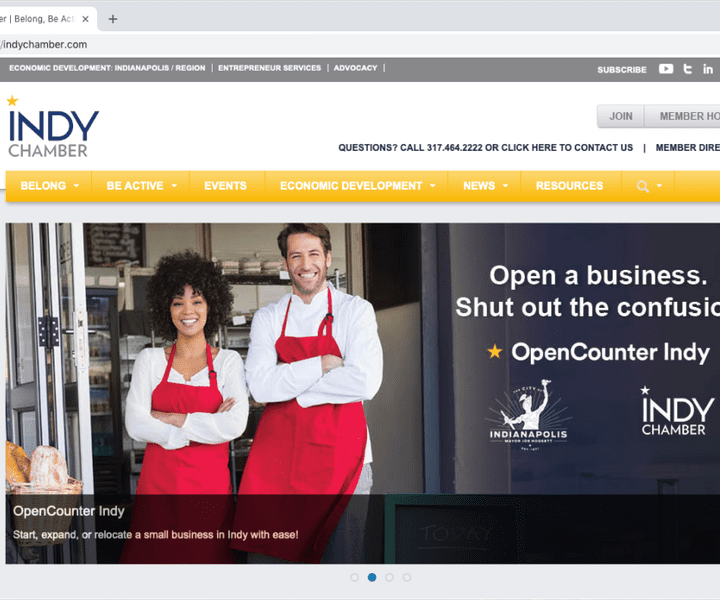 Seven months after launch, the new IndyChamber.com averaged 10,000 monthly users with 26,000 page views, much better than the site has ever delivered. Pellman expects those numbers to grow as new, more relevant content is added. 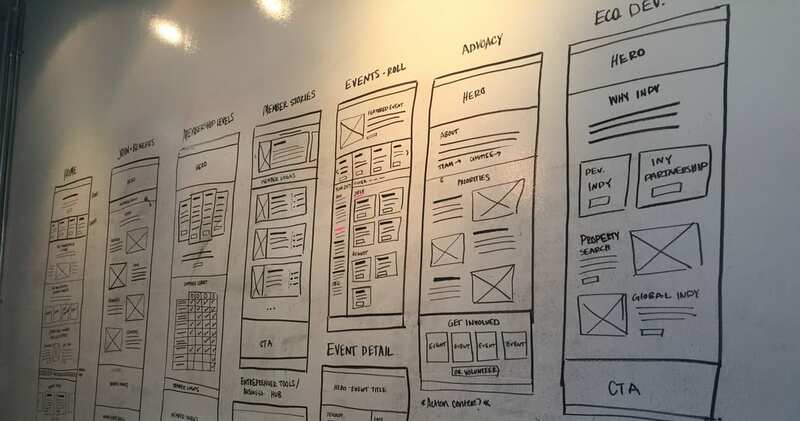 The Indy Chamber and Design On Tap continue to measure progress, gain new insights, improve the user experience and create new experiments in which they can increase numbers related to lead generation and engagement. The January 2018 launch stepped up the Indy Chamber’s marketing team’s game in terms of relevance of the organization, and that’s just the start. “We are excited about potential growth going forward and see this as a chance to keep engaging with Design On Tap,” Pellman says.